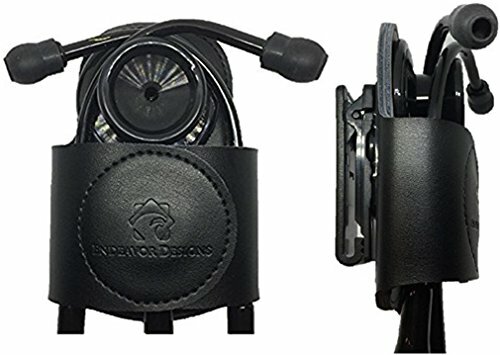 SECURE-A-SCOPE - Genuine leather universal stethoscope holder with unique rotatable clip. Premium quality, superior grip, and strength - The perfect CURE for stethoscope neck carrying, loss and misplacement. DESIGNED AND PERFECTED BY AN AMERICAN PHYSICIAN: Looking to solve the problem of losing multiple stethoscopes and being unsatisfied with stethoscope holders on the market that simply did not hold up to the rigorous standards and demands of the healthcare field. We made SECURE-A-SCOPE with the best intentions: to help you best help others. Should you ever need it, we will gladly repair or replace your SECURE-A-SCOPE and continue to work towards perfecting the ideal product for all healthcare providers. TESTED DURABILITY AND QUALITY: Sets us apart from the rest. DUAL-layered genuine leather lining on both interior and exterior surfaces provides a strong, guaranteed long-lasting, water-resistant, SECURE holster for all stethoscope types. The dual-layer also prevents the accumulation and transmission of bacteria by making this scope holder easier to clean and sanitize. Intricate stitch work with strength-tested threads translate into an exceptionally strong and durable holster. This worry-free design tightly secures all stethoscope types with high-end Velcro lining the interior flaps of the holster. UNIVERSAL FIT AND GRIP: With both the stethoscope and the user in mind. Designed to accommodate all stethoscope variations, including adult and pediatric stethoscopes, cardiac, electronic and amplified stethoscopes. Featuring a unique rotatable clip that is made to accommodate all user preferences: belts, white coats, scrubs, dress pants, shirt pockets, purses, backpacks, you name it! TRIED, VERIFIED, AND TRUE: Thanks to feedback from nurses, doctors, paramedics, residents, medical students, veterinarians, and other healthcare workers, we can proudly say that SECURE-A-SCOPE is a distinctive stethoscope-securing mechanism that allows users to carry, access, and re-holster their stethoscope quickly and worry-free. We are 100% certain the SECURE-A-SCOPE is the ideal solution for daily stethoscope carrying and storage -and take pride in providing a holster that is built to last. LIFETIME Warranty! In return for our customer's loyalty to our brand, we offer lifetime free repair or replacement for defective holders due to materials or craftsmanship! Simply contact us through the amazon email portal and we will walk you through the process of repair/replacement. At Endeavor Designs, our customer satisfaction is our top priority! If you have any questions about this product by Endeavor Designs, contact us by completing and submitting the form below. If you are looking for a specif part number, please include it with your message.